Apple has quietly released a firmware update to the now-discontinued AirPort Express product line, introducing support for AirPlay 2 to the router ahead of the expected public release of iOS 12 this fall. The Apple Support site advises "firmware update 7.8 adds AirPlay 2 support to 802.11n AirPort Express base stations." AirPlay 2 is Apple's update to its media streaming protocol, enabling features such as stereo pairing on the HomePod and multi-room audio for compatible devices. The betas of iOS 12 gave some hope that Apple would add AirPlay 2 to AirPort Express units, with the appearance of the 2012 redesign in the Home app for the first beta, but it could not be added as a HomeKit peripheral. After the second beta, the Home app popped up an alert advising an AirPort Express update was available and needed to be applied, but at the time there wasn't an update available. 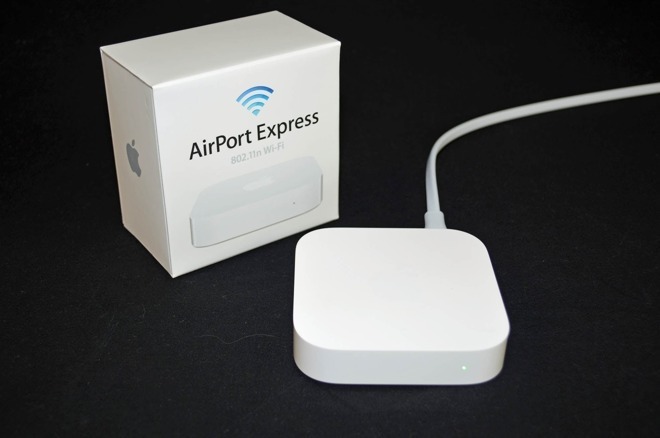 To install the firmware update, AirPort Express users have to restart the router via the AirPort Utility, then select the base station to see if the update is downloadable. If an update is available, an Update button is presented, which will command the base station to continue with the installation. In April, Apple announced it had discontinued the long-running AirPort Wi-Fi router line, with existing online and in-store stock being the last remaining units it would sell. The news followed a year after reports Apple had broken up its AirPort devision, shuffling employees to other areas and projects in an apparent sign the product line was close to ending. In January, Apple started to sell the Linksys Velop Mesh Wi-Fi System online and instore, an apparent break in Apple's policy to only sell its own routers, and the first third-party router to be sold in its retail outlets.